List of 20 Mind Blowing One Page Parallax WordPress Themes 2018. 20 Mind Blowing One Page Parallax WordPress Themes 2018. As a startup, you can make things easy for your audience by adopting a parallax WordPress site. A website is a convenient place to organize all the information you need regarding your business. Having multiple web pages has always been the trend in ensuring clients are able to get specific information from each web page. However, what if you could have everything uniquely organized in one place. In truth, web users have a short attention span. They do not have time to scroll through all your web pages unless they are really intrigued by what you are offering. And getting them intrigued is the hard part especially if you are an agency, corporate company, or e-commerce business that is just starting out. Nonetheless, it is possible to have beautiful one-page website that avails everything to the consumer in one scroll. Websites with a parallax scrolling effect are eye-catching and easy to navigate. 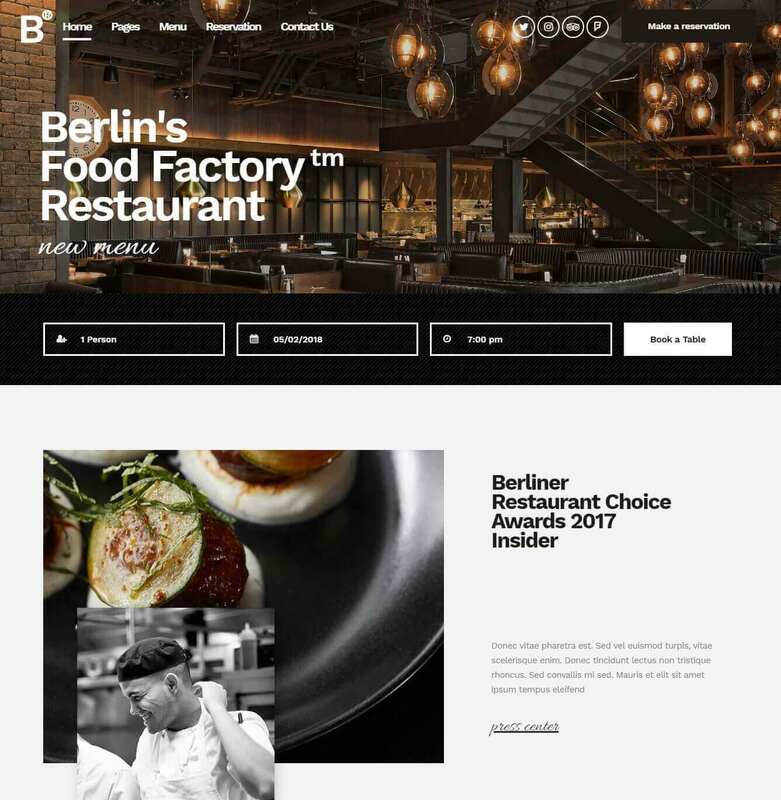 Here is a list of the best 20 WordPress themes of 2018 that adopted the intriguing parallax effect. 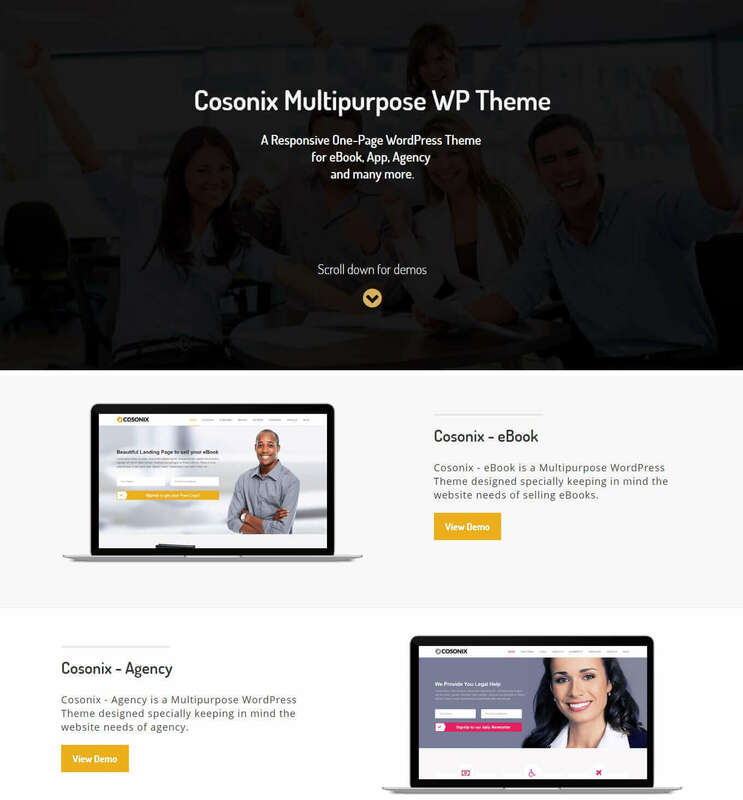 Cosonix is a one-click install WordPress theme that will have your website up and running. Alternatively, you can choose to work with the inbuilt page builder to make additional custom changes to your website. Cosonix supports the minimalist look and is ideal for any individual or company in the medical, corporate, travel, law, agency, or e-commerce industry. Cosonix comes with pre-built and customizable page templates to get you started. Use the available visual composer plugin to start dragging and dropping items on your web layout. Cosonix supports real-time editing and you can always go back to make additional changes if need be. Other premium plugins that come with Cosonix include MailChimp and AJAX contact forms. This ensures that your customers are able to sign into your site or receive emails on new products, services or improvements on your website. Cosonix also supports e-commerce plugins like PayPal for accepting payments. Whether you are selling a service or product, this WordPress theme gives your business the professional online presence it deserves. 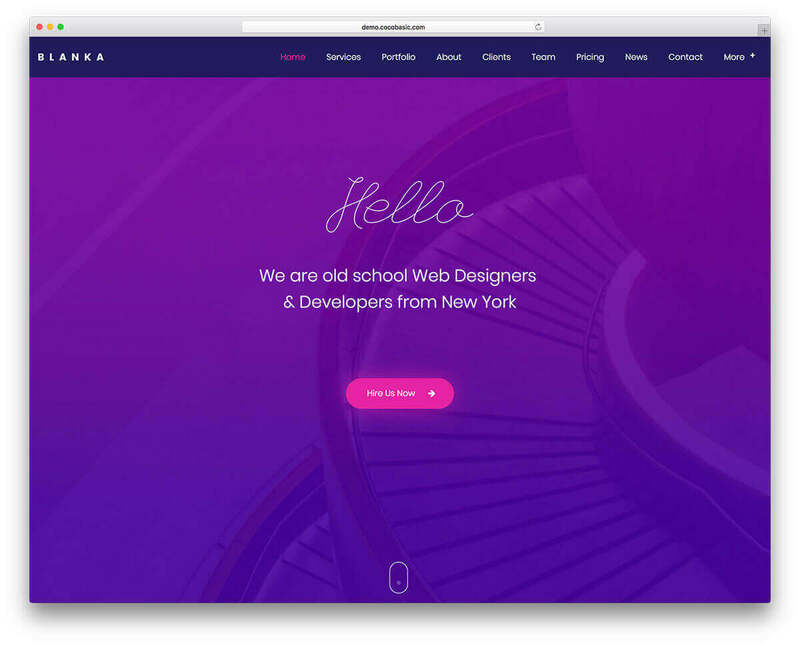 Uncode is a pixel-perfect WordPress theme that packs plenty of features to help design your parallax website. It uses WPBakery page builder which works a lot like Visual Composer. Uncode is rated with a 98% speed score as it loads faster on any device it is opened in. There are over 40 pre-built layouts to start you off. Uncode includes premium plugins like Revolution Slider and Layer Slider to add parallax scrolling to web page sliders. This feature also comes in handy when displaying your products using carousel sliders. Uncode comes with over 1000 pre-designed icons to add visual interest to your online content. This theme includes CSS3 animations to bring life to your webpage with each scroll. Other perks to look forward to with Uncode WordPress theme include Crispy SVG logo, Social share, iLightbox, Google Fonts, Type Kit, and FontDeck. WooCommerce is included to help set up your online shop and start selling. Uncode is also WPML certified and comes with full RTL support. Divi is one of the few WordPress parallax themes that come with an independent page builder. The in-build Divi Builder works similar to Visual Composer but faster and more powerful. Divi has a flexible design and supports future expansive functionality. There are over 40 unique content templates to start working on. Use the inbuilt page builder to drag and drop elements where you want them. Divi allows you to zoom out and see if all elements are well placed and in harmony with each other. Divis’ page builder lets you edit everything in real time- changing font, size, color, or style and watch the transformation happening instantly. Changing text is as easy as clicking and typing directly on the user interface. Divi is designed to be highly responsive on PCs and Mobile devices. You can independently edit the main web page to fit perfectly on any screen you open it in. Though Divi is designed to support one-page scrolling, you can still use it for websites that require multiple web pages. 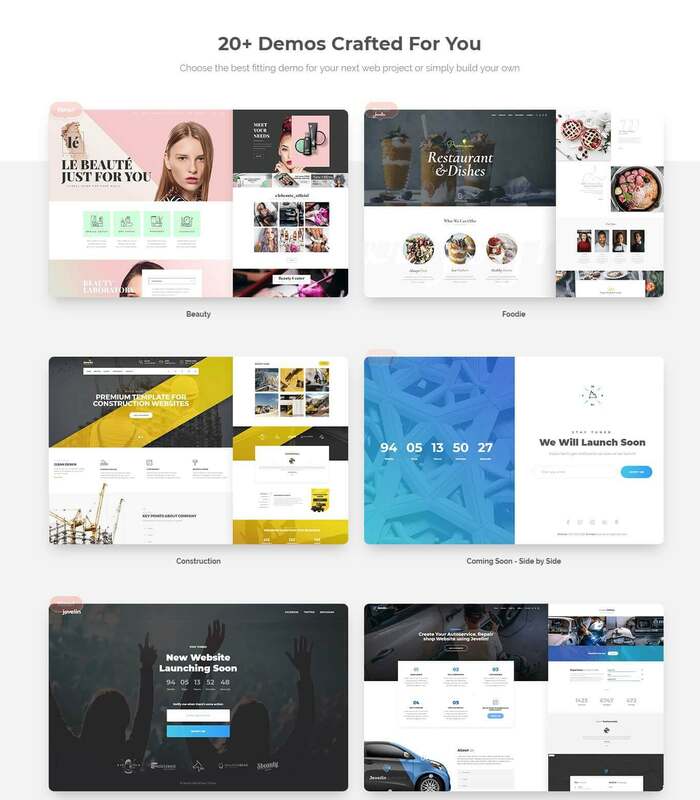 Jevelin is an intriguing WordPress theme designed for blogs, agencies, e-commerce shops, or personal online portfolios. It comes with over 40 unique elements and an inbuilt admin panel that gives you full control of how you design your website. Jevelin WordPress theme is highly responsive and makes use of the popular parallax scrolling effect. Jevelin WordPress theme comes with an inbuilt page builder to help design your website. You do not need to be a pro webmaster or knowledge in coding to get started. The quick drag and drop action helps you work faster and precisely in building your web pages. This WordPress theme works perfect in one-page parallax scrolling and can also support multi-page design. There are 6 blog and portfolio layouts to customize and suit your brand. WooCommerce plugin is added in case you want to monetize your blog or website. You also get plenty of new social media plugins to make your content go viral in one click. 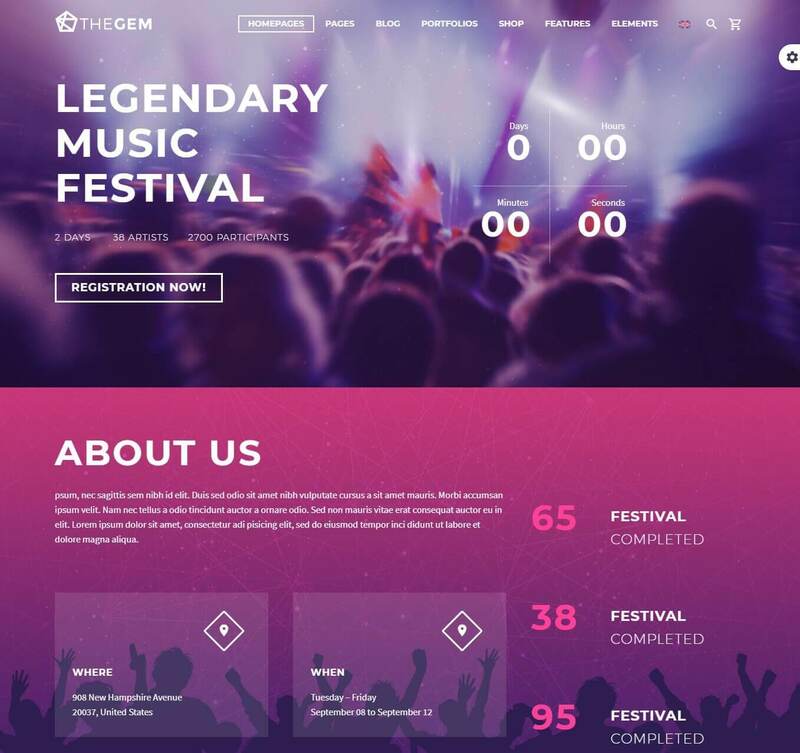 The Gem is a professional WordPress theme for business but can also be used in the creative world. It features a modern stylish design and comes with all the features you need to design your website on the go. The Gem is compatible with premium plugins like WooCommerce and WPML. Whether you want to launch a professional creative agency or an online portfolio, The Gem will help you do that. It packs plenty of prebuilt layout designs to start you off in your web design. This WordPress theme has a page builder that lets you arrange elements in a drag and drop process. No prior knowledge of coding is required and you can design a professional website in minutes. The Gem also integrates social media plugins like Facebook. This will help you share content on in one click and bring traffic to your website. The WordPress theme is also SEO ready which will help in the ranking of your website. 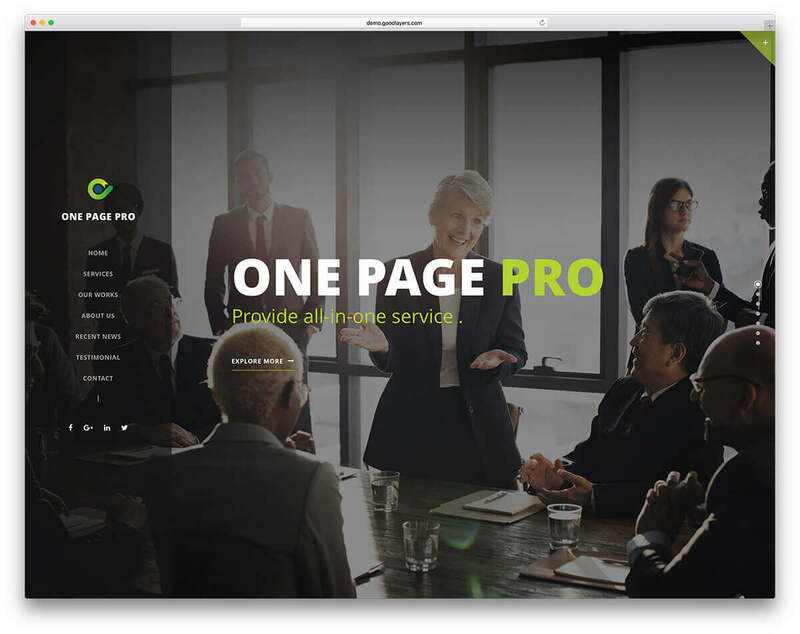 As the name suggests, One Page Pro is a WordPress theme that puts all your professional information on one page. Your users will see all your important information without having to load multiple pages. Designing your first website is a breeze thanks to the inbuilt user-friendly GoodPlayer page builder. One Page Pro has two ready-made demos that you can import into your page builder. You do not have to build everything from scratch when you can import and change elements to suit your brand. You have over 19 header styles to work with and an advanced admin panel where you make all your changes. Feel free to come back to your website anytime and make the changes you need. The admin panel has creative tools to help you change color, create custom sins, export custom templates to your site, or make any changes necessary to improve your website appearance. An inbuilt maintenance mode will alert your users to be patients as you work on something better for them. Kallyas is a WordPress theme for the business owner wanting to launch their first website or revamp an old one. It also suits marketing agencies that want to run a massive campaign and need a quick online platform to do so. Kallyas WordPress theme is fluid and dynamic enough to build a professional one-page site in minutes. This WordPress theme comes with an inbuilt page builder with 12 readily designed homepages. You only need to customize the available elements to make them adapt to your brand or campaign. In addition, Kallyas is SEO ready and packs all the necessary SEO performance tools to get your website or campaign ranked highly. You do not need to be a pro in coding to get started with this theme. It only texts one click to install and start using Kallyas theme. There is an inbuilt live text editor to alter font however you want and improve your site’s typography. You also get new and free demos each month you can use for inspiration. 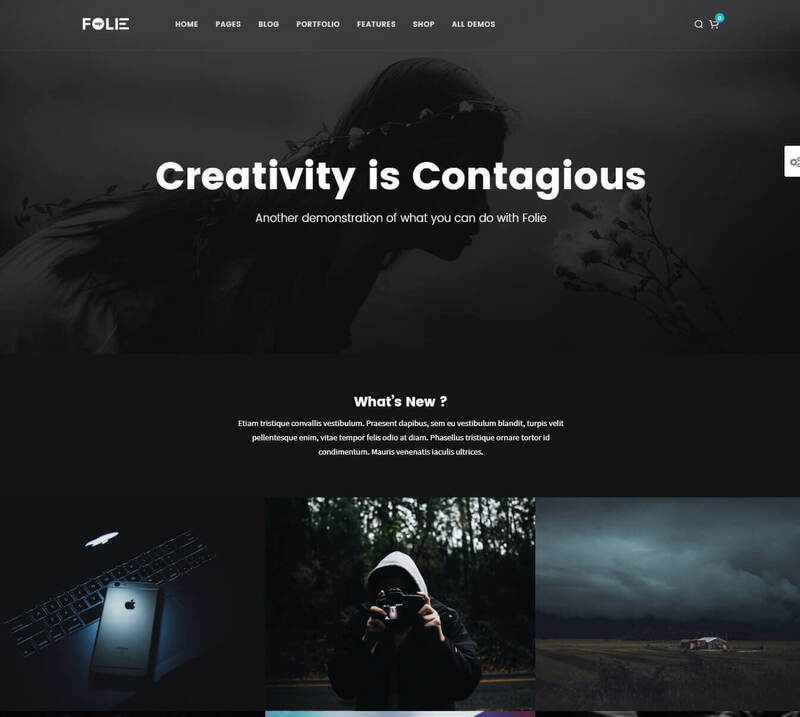 Folie is a WordPress theme designed for the business that wants to launch a one-page site in one click. This theme is sleek, sophisticated and very responsive on multiple browsers. Folie also maintains low server loads even under heavy user traffic. Folie WordPress theme uses a unique live builder that is an expansion of Visual Composer. The new page builders put new features into the webmaster’s fingertips. Designing your first website takes a few minutes and you do not need prior knowledge of coding. Explore over 25 pre-built website templates that are customizable to fit your needs. Folie is highly responsive and loads fast on any browser. This WordPress theme also comes with an optimized codebase that prevents serve overload even under heavy traffic. Mix and match elements with the inbuilt content block. Drag and drop items until you achieve the perfect one-page website. Folie comes SEO ready and is integrated with premium plugins like WPML and WooCommerce. Bridge is a multipurpose WordPress theme with plenty of premium features. It is ideal for creating a one-page website that includes videos playing in the background. Bridge comes with pre-made demos you can customize and have a professional website running in minutes. Bridge uses the latest visual composer page builder. It is also preloaded with 7 hand-made portfolio layouts for professionals who want to put their best work online. Other notable features include custom headers, background video section, and fixed or sticky header with a menu. You also get several logo headers to get you started on building your brand. Bridge parallax WordPress theme is compatible with WPML and WooCommerce. It is also retina ready and comes with full screen support across all smartphones, tablets, and desktop screens. 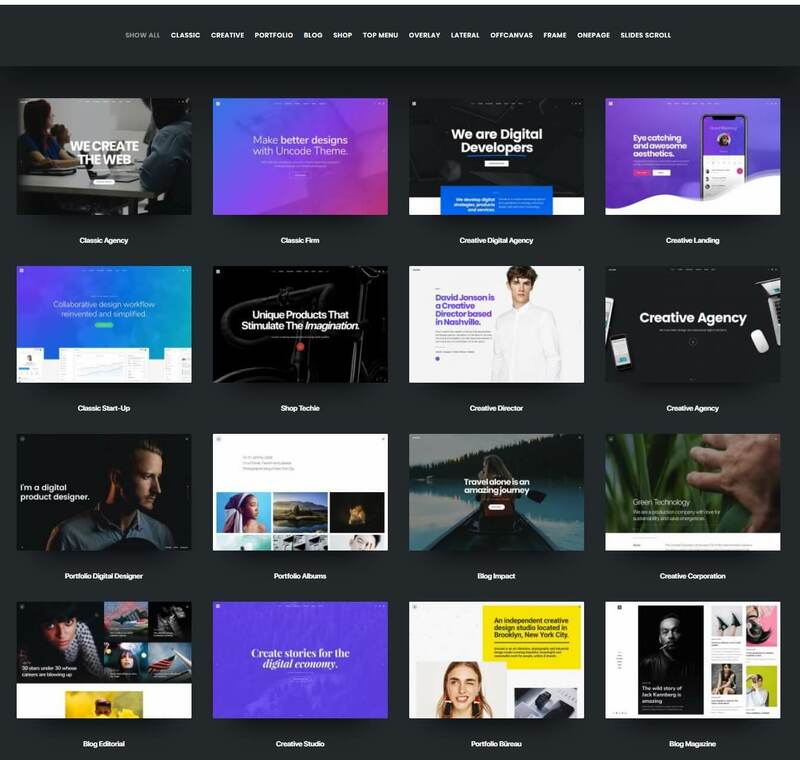 Bridge WordPress theme is designed for creative agencies, business opening online shops, or the professional wanting to launch an online portfolio. Install and update your blog with just one click using Bridge WordPress theme. 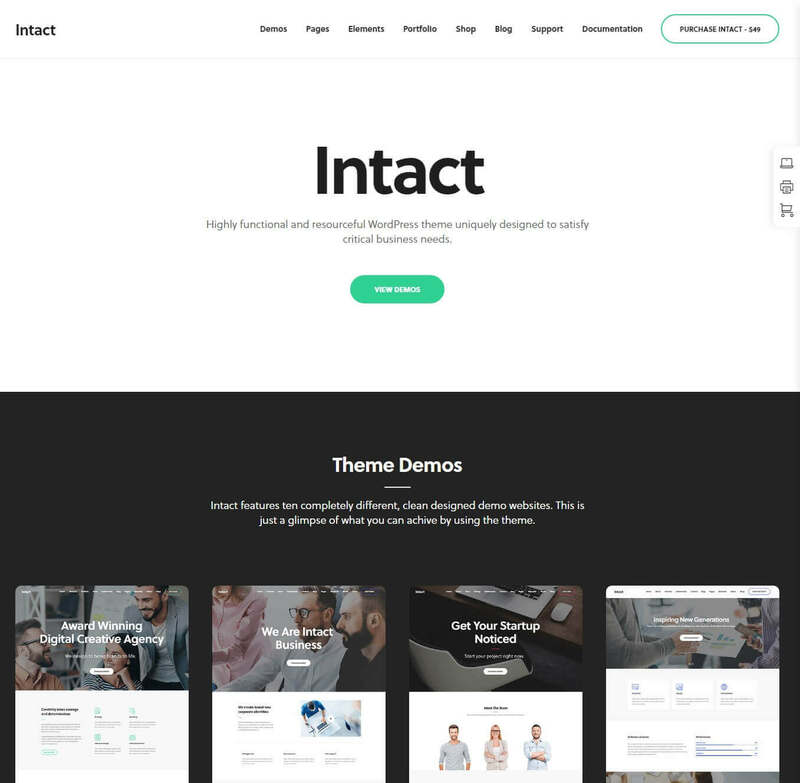 Intact is a clean and modern WordPress theme designed for one-page websites. It embraces the classic parallax effect and also uses CSS3 animations. This WordPress theme also comes with prebuilt short codes that do all the heavy lifting for you. There are over 8 unique homepage demos to get you started. Use the inbuilt visual composer to drag and drop elements as you design a unique homepage. Add animations and parallax sliders where you want to draw your user’s attention. There are over 12 prebuilt columns to add your information. Explore over 600 plus custom google fonts to help you improve your website’s typography. Intact WordPress theme is designed to be pixel perfect when viewed on mobile, desktop or tablet. Design a professional website with pre-built layouts and view them in full width on any screen. Intact is SEO ready and also optimized to load faster on any device. This WordPress theme is suite for any business demanding a swift online presence. 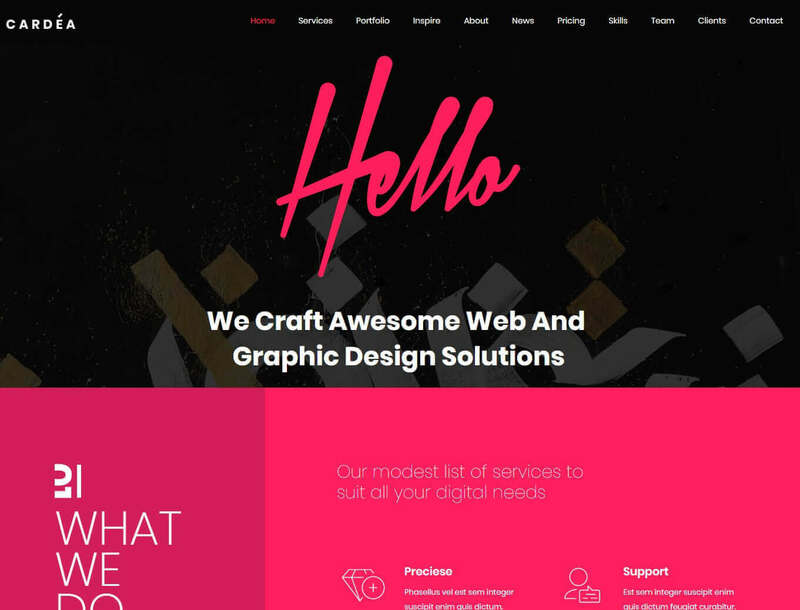 Blank is really colorful and boasts of a minimalistic layout that is perfect for any creative or agency. It is the go-to parallax WordPress theme for the photographer wanting to build their online portfolio. It also suits the fashion house that wants a new appealing look for their brand. There are 8 pre-built homepage layouts to get you started. An inbuilt page builder comes with ready-made shortcodes to help customize elements on your webpage. For the tech-savvy, this WordPress theme also facilitates the building of custom codes to further alter your layout. Blanka WordPress theme supports parallax scrolling as well as animated CCS3 features. There are over 700 google fonts preloaded to help you with your typography. Play around with the array of colors to create a layout that is elegant and appealing to your users. Blanka is 100% high resolution and is compatible with multiple web browsers. 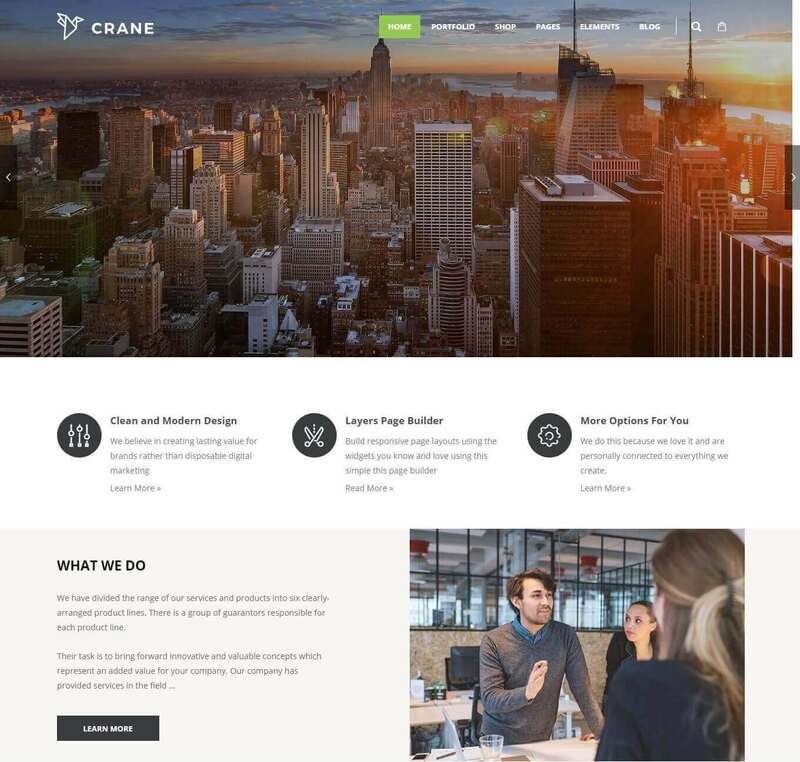 Crane is a light WordPress theme that installs and launches in minutes. It has been voted as a beginner friendly theme with multiple homepage layouts to get you started. In addition, Crane WordPress theme comes with premade demos that can be directly imported using the smart demo import feature. Imports are incredibly fast and customized layouts relatively easy. It is also possible to preview how your website will look like before launching it. Crane WordPress theme add 25 free Shutterstock photos at your disposal. You also get 7 premium plugins which include WPBakery, Ultimate Add-ons, Groovy Menu, Slider Revolution, ConvertPlus, Massive Add-ons, and Layer Slider. Crane WordPress theme suits that business that sells digital products or physical goods. Incorporate WooCommerce plugin into your website to instantly turn it into an online shop. Crane loads fast on any device and is compatible with popular web browsers. Install Crane theme in one click without writing a single line of code. 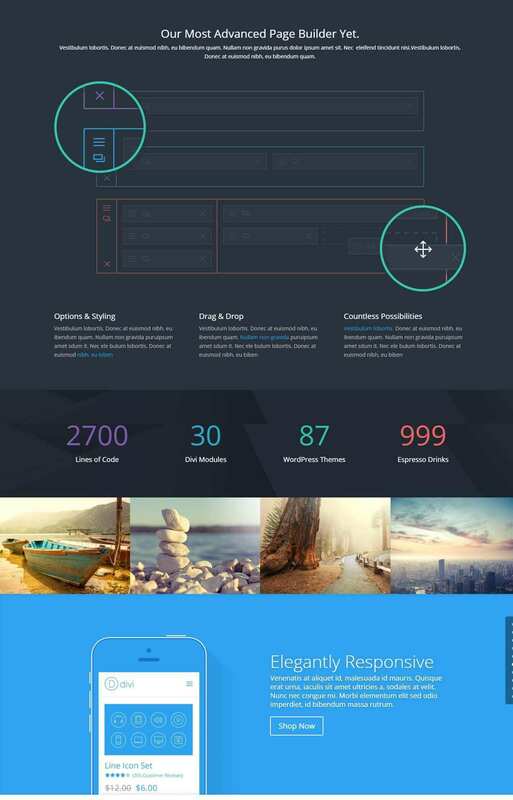 Massive Dynamic is a multipurpose WordPress theme loaded with convenient features to build your website. Whether you are an agency, online shop, SEO Company, or a consultancy firm, this WordPress theme will help you build a professional website in one click. It also comes with premium products to help you communicate with clients or turn your site into an online shop. This WordPress theme comes with over 70 handmade one-page layouts that can be customized to suit your brand. Use AJAX animations to make your content more visually interesting. Install premium plugins like WooCommerce and WPML to set up a quick online shop in any language you wish. Massive Dynamic is also compatible with web browsers like Opera, Firefox, IE, Chrome, Edge, and Safari. 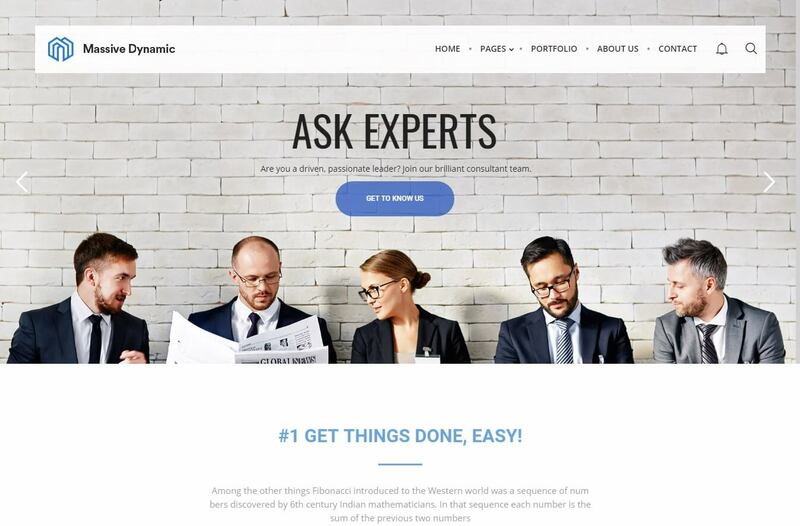 Massive Dynamic will launch your one-page professional website in just one click. This theme also comes with a prebuilt notification center where you receive regular free updates. Caliris is a WordPress theme that is simple and straight to the point. It is built for the website owner who wants a clean look on their site that highlights the main content. Caliris parallax theme comes with preloaded shortcodes which take away the pain of having to learn code. This is a responsive WordPress theme that will fit on any mobile or desktop screen. In addition, Caliris is designed to be compatible across major web browsers. There are over 9 different page layouts to help you custom build your site. Caliris uses Ajax to animate content and make your website more appealing and interactive. 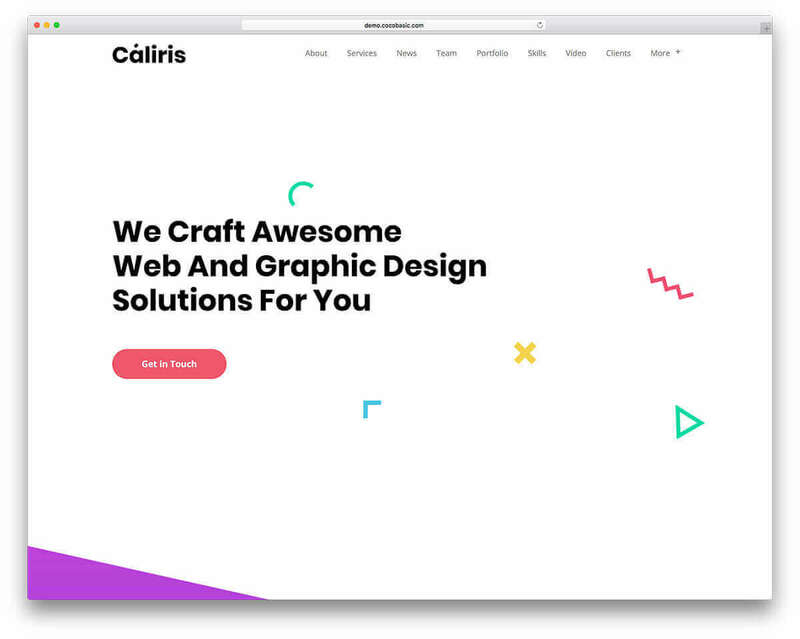 If you are a new startup that wants an inexpensive WordPress theme to set up a site, Caliris is the theme for you. It packs the basics you need to create a website with one click even for the amateur web builder. This theme is highly responsive and supports smooth scrolling on any screen. 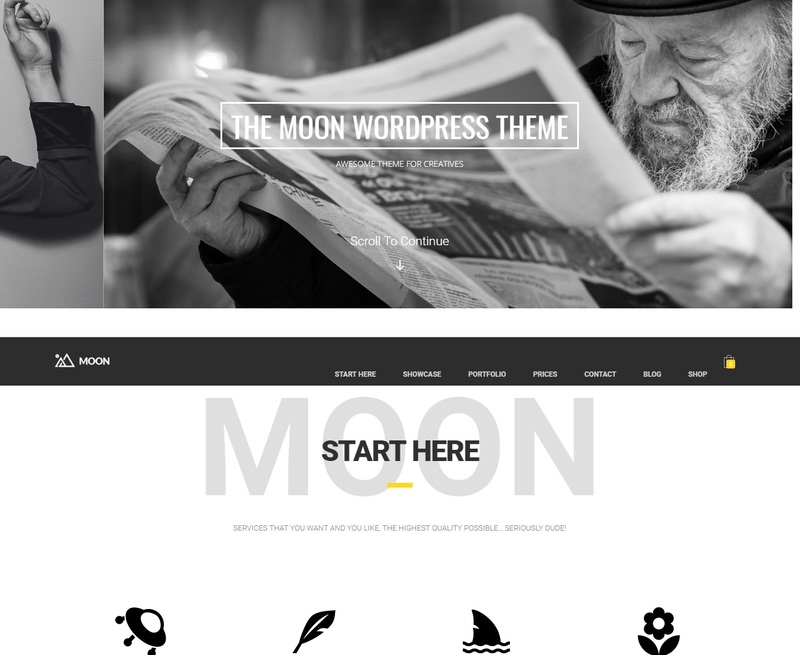 The Moon is an excellent WordPress theme for you if you own a photography business, fashion house or want to run a creative campaign. The moon is designed with creativity and an innovativeness that will keep your website relevant even in future. An inbuilt page builder avail unlimited shortcodes to work faster in customizing your website. The Moon comes with custom layouts for every season–including a winter theme to activate during Christmas. Besides the amazing parallax scrolling, this WordPress theme also comes with animated social icons to add to your content. Play around with the unlimited color options to achieve a look that speaks your brand. There are over 620 fonts icons and unlimited google fonts to customize your site typography. The Moon also support background videos which can be toggled to full screen in one click. 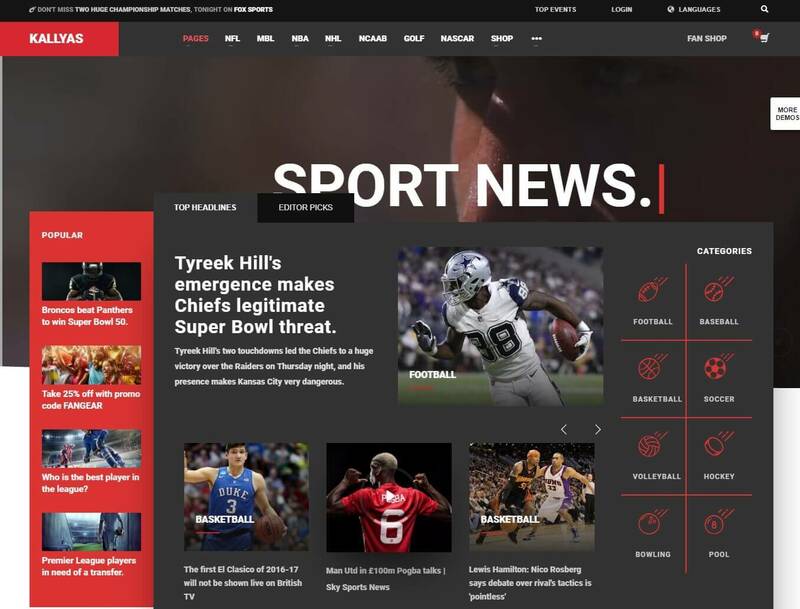 A special intro section is added to give users a teaser of what your site is about. For avid bloggers, there are several custom post templates on this theme. Other notable blogging tools include classic blog, toggle blog, and free social media sharing buttons. Whether you are building a personal or professional one-page website, Themo WordPress theme has all the tools to get you started. This parallax WordPress theme incorporates the latest plugins to help interact with your users as well as set up an online shop. Themo comes with prebuilt demo layouts that can be imported in one click. Create unique and attractive page layouts using the provided Visual Composer. Other tools you will find useful are Revolution Slider and Layer Slider for adding a carousel effect to your content. Themo also comes with a unique parallax composer to customize the smooth scrolling effect on your website. Themo WordPress theme gives you a chance to wow your audience at the same time providing a seamless web scrolling experience. This theme is fast, very responsive, and is compatible with most popular browsers. It is also lightweight ensuring it loads faster even under heavy online traffic. 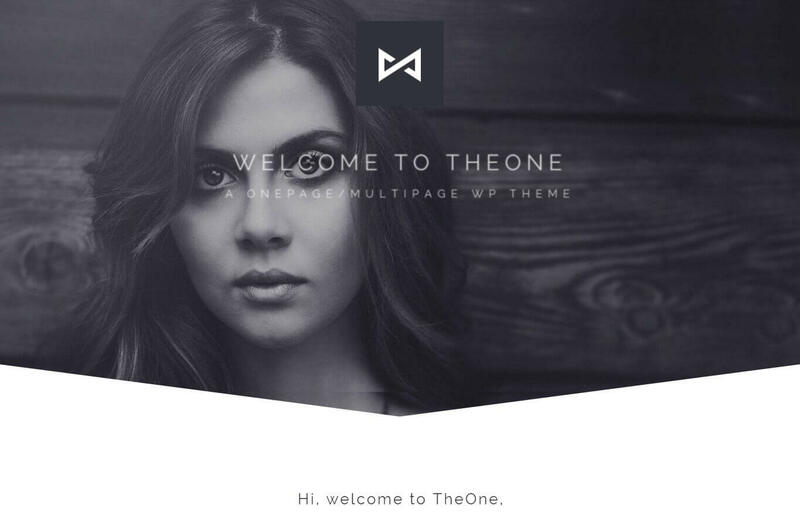 Theone is a modern fully functional WordPress theme that is compatible across several browsing platforms. It features premium plugins that help with language translation, web page building, and turning your blog into an online shop. Theone includes 9 unique ready-made demos to get you started on building your website. Theone supports parallax scrolling which animates your website, online resume, or creative portfolio. There are over 300 custom icons and 600 google fonts to create a unique and attractive typography for your site. Theone comes with unlimited pre-designed layouts that are installed with one click. This WordPress theme incorporates WPML for translating your website into multiple languages. Work with an unlimited color palette to add interesting hues to your website. Theone is also designed to be compatible with Google Maps and Contact Form 7. Theone WordPress theme loads fast and fluidly on any stationary or mobile device. It will adapt to both your smartphone and desktop screens. Scalia WordPress is preloaded with all the necessary tools to help you start selling on your website. It is a WordPress theme designed for businesses and bloggers who want to give their current websites a new look. Scalia puts everything at your fingertips, making designing your first website a breeze. There are 5 unique homepage designs to start you off. In addition, Scalia WordPress theme comes with 150 handmade page templates that can be customized however you want. Browse through a plethora of layouts for your portfolio including multiple gallery templates for displaying pictures. Select and design your own e-commerce page from multiple shop pages provided with the theme. Scalia uses the latest visual composer page builders that eliminates the need to learn to code. Designing your website is a simple drag and drop process of arranging elements until they fit exactly how you envision them. This WordPress theme is also designed to integrate with WooCommerce, to help manage payments in your online shop. Cardea is a lightweight and flexible WordPress theme designed for individuals and businesses. It is the perfect WordPress theme to launch a one-page website and establish your online presence. Cardea is responsive and will fit on any screen size- mobile, desktop, and tablet. Cardea is presented in both light and dark themes. It comes with XML demo files which can be imported directly into your page builder. A shortcode generator is provided meaning you do not have to write your own code. There are 12 premade sections to choose from and start working on your website. An inbuilt color palette lets you experiment with endless color combinations to achieve a personalized look. Cardea is easy to customize and make changes in real time. Whether you are running a business or want to establish an online portfolio, this WordPress has all the tools you need. It loads fast and is compatible with most top web browsers. Incubator is a stylish and efficient WordPress theme designed for one-page e-commerce websites. It is super light and comes with an inbuilt page builder to help you create a professional website. You do not have to be a webmaster to work with Incubator theme. Incubator WordPress theme includes premium plugins like Revolution Slider and Visual Composer. Both plugins help you craft fluid and visually appealing web pages without having to write code. Revolution slider adds parallax effects to your videos or images displayed in carousel. This WordPress theme features 12 pre-built demos that install in one click. Feel free to customize the demos until you achieve a look that represents your brand. 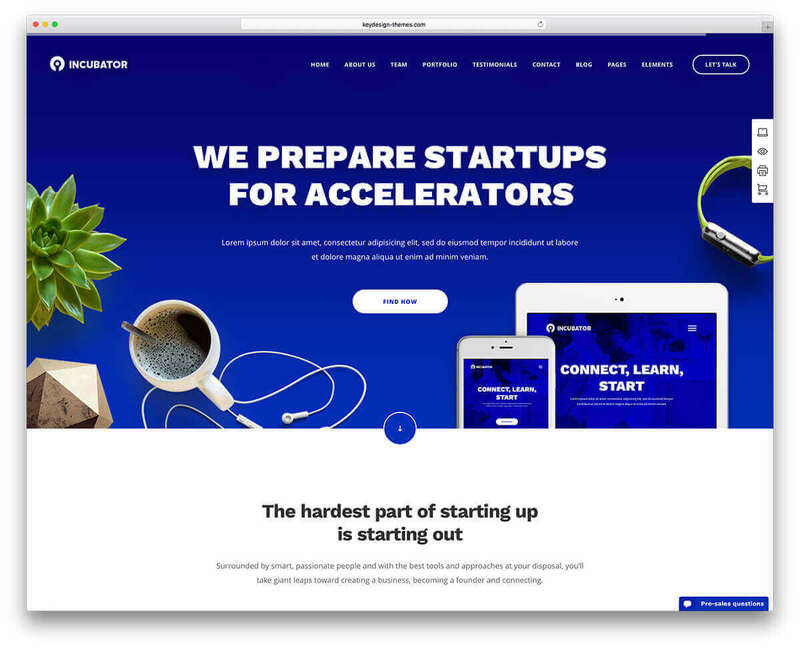 Incubator theme is ideal for an SEO agency, creative hub, online shop, or a tech company. The pre-built templates are easy to customize even for the amateur who knows nothing about coding. Add WooCommerce to turn your website into an online selling shop.